A lot of people think that if you’ve got something that is plastic, that’s it. You have to deal with the way it looks forever; that or throw it in the bin and buy something new. Well, I’m here to tell you that is definitely not the case. Just because it’s plastic doesn’t mean you have to put up with that dated garden chair. Plastic can definitely be your next DIY craft project. So, push up your sleeves, let your creative juices start flowing whilst I tell you of the best spray paint for plastic. Will Spray Paint Cans Work on Plastic? A lot of people assume that paint will not work on plastic due to its shiny, nonporous finish. I will admit that it does need a bit of prep work, but most painting jobs do. The thing to point out is that painting plastic isn’t the same as painting wood, they need different equipment and different paint to ensure the job is completed to the best standard. As mentioned previously, plastic has a nonporous finish which means you need to use a paint that will stick to the surface, rather than get absorbed by it like wood does. Spray cans have a specially designed nozzle that deals especially well with thicker, acrylic style paints. These paints will stick better to your plastic project and prevent a bobbly finish or big drips. Most spray guns aren’t equipped to deal with the thicker paint and require thinning. This works perfectly fine with wood as the paint has got a better surface to stick to. However, when spraying plastic, this will not give the optimum finish and will result in a shoddy coverage. Spray paint is used to rejuvenate several different surfaces, so before you start your project you need to make sure that you have got a spray paint that is designed for your particular task. Color is the next thing you need to consider. The number of colors available on the market now for spray paint is endless, and you don’t want to get end up wasting your time and effort on your project to just end up with a color you’re not totally in love with. If you are spraying plastic on a car, make sure you research your car model online – this will provide you with the exact color the manufacturer used and you won’t end up with a two-toned colored car. Finally, do you need a primer? Some plastic surfaces will need a bit of elbow grease before and then a coat of primer before you can start splashing your color around. Some spray paints state that you won’t need a primer as the acrylic base will stick to the plastic. However, depending on the surface that you are spraying, sometimes it is better to apply the primer just so that the end result is smoother and a better finish. You need to make sure there is no grease or grime on your surface. Any left-over residue will distort the end finish. Make sure you clean the item thoroughly with warm water and soap, making sure there is no soap residue left after you’ve cleaned it. Wiping it down with an alcohol-based cleaner will ensure that even the tough stains are able to be removed. Make sure that you leave it to dry thoroughly before proceeding to the next step. As mentioned previously, plastic is nonporous so you need to give your paint something to stick to. By sanding down the item, you are removing the shiny surface and providing the paint something to hang on to. Just be careful to make sure that you remove any dust from sanding with a brush or a clean cloth before diving in with the next step. The dust will stick to the surface and leave you with a bubbly finish when it is painted if it is not removed. Now for the fun part. Make sure that you mark off any areas that you don’t want to be painted with tape. Read the instructions on your spray can. Although the process is pretty much generic across the board, you don’t want to be caught out. Because the can is pressurized, you will need to shake the can well before starting painting and throughout. I would also suggest doing a color test on a piece of cardboard before going in head first; this will ensure that you are happy with the color you have chosen. Now for the fun part, start spraying! Spray a thin layer onto your surface, but don’t expect full coverage straight away. Continue doing thin layers of paint, letting it dry for a couple of minutes between each coat. This will ensure you get an even coverage. Make sure that you let your project fully dry. You need to leave your project to dry in a well-ventilated area to prevent any pesky fingerprints. Once all these steps are completed, you will be able to show off to every man and his dog your newly rejuvenated surface and be the envy of your friends. 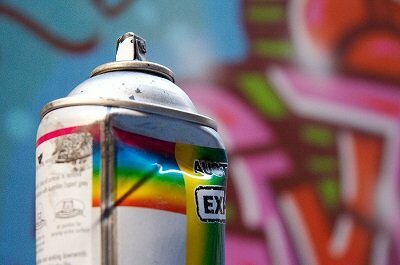 If you are still unsure of what spray paint to get, I have put a list of the best five spray paints to use on plastic. The first thing to note about this spray paint is the vibrant color. It is that popular that it does tend to sell out on Amazon.com, but never for long. This just shows how popular a product it is and how much other buyers rate it. It is a thicker paint which can paint straight onto plastic without the added cost or labor of using a primer if you have fully prepared the surface and regularly wipe the nozzle. It provides a glossy, smooth coverage and the shiny finish just helps accentuate the bright color. This color is definitely not for a subdued project, but will provide a burst of color to any project. For a classy look, matt black is definitely the way to go. This spray paint is fast drying without any dripping from the nozzle. This product also boasts that it doesn’t only cover plastic, but can be used on a variety of surface which means that if you don’t end up using it all, you can use it for your next project (whatever that may be). This product does recommend using a primer beforehand to ensure the optimum finish. But if you follow the instructions properly, your project will look as good a year on as the day you painted it. When choosing your spray paint, you need to consider what surface you are going to be spraying. This CANBRUSH spray provides excellent coverage on a variety of surfaces, including plastic. This spray paint is both petrol and grease resistant, which could definitely be a major factor, depending on what you are painting. Another bonus of this paint is that you are pretty much getting two for the price of one and it comes in a wide variety of colors; so, who’s to say that you need to stop at just doing that garden chair? Let your imagination, and spray can, run wild. This spray paint not only bonds to plastic, but a variety of other surfaces so it is fully functional for all your craft projects. Another bonus of this product is that it doesn’t require any sanding or priming, which cuts out a laborious preparation step. It boasts that it is chip resistant and quick drying, stating that it dries in less than 15 minutes if you let each coat dry between layers. Some paints have a habit of peeling off plastic, however, this one is durable whilst providing full coverage. The camouflage olive is usually used for hunting apparatus, however, could be used on a variety of different projects. Last but certainly not least is the Rust-Oleum in French Lilac. Although similar to the Seaside version, it’s nice to see you can spray paint with more pastel colors; something that is usually attributed to with regular roller paint. One misconception is that all spray paint for plastic needs to be bold colors to provide the best coverage. However, this spray paint breaks those barriers. Practicality wise, it does everything that you want a spray paint to do when spraying plastic. However, this color, in particular, shows that your color choice doesn’t need to be bold, and dare I say it, garnish, to cover this difficult surface. This feminine and light color opens countless doors to your spray painting possibilities. Spray painting plastic is not something that you can go into on a whim. It needs a lot of preparation and thought before you take on this task. But that does not mean that your project is not achievable. If you are willing to put the preparation work in, the results you could achieve are astounding. Spray cans are regularly underrated, and spraying plastic is classed as a no-go area. However, if you have a plastic project that needs a bit of Va-Va-Voom, don’t be scared. Follow the steps and you will be able to give any plastic surface that WOW factor. Hello – I hear that Krylon Fusion for plastic has been discontinued. I’ve looked for it at several big box and hardware stores. They have dwindling suplies and are not replacing them. I’m midway through a project and want to know what is compatible with Krylon Fusion–perhaps in the Krylon and Rustoleum families. I already have a coat of Krylon on my lawn chair, and don’t want it to pucker or buckle. Thanks. Hi Kristine, Krylon is still around and plenty can be found. The easiest place to buy is Amazon as they have plenty of colors. Best ask your local hardware store if the newer Krylon spray paints are compatible with the Fusion range. I need to paint 5 1500 gallon rainwater collection barrels. Can I get paint for plastics in larger quantities than just spray cans? I have a sprayer and compressor, plus a very large shop to paint them in, but have not been able to find a Krylon type paint in 1 or 5 gallons.